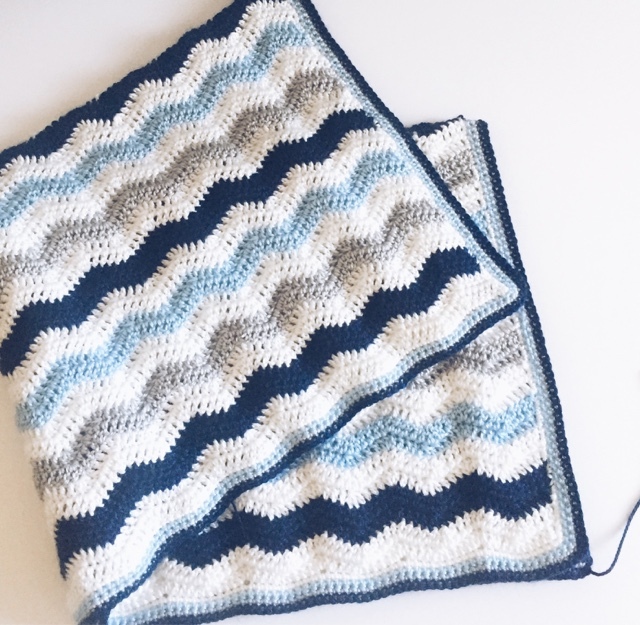 And when your finished, it is a perfect gift for a brand new baby boy. Work a multiple of 10 chains to however wide you’d like your blanket. I usually go about 32 to 36 inches wide and about that high. Row 1: DC into 4th chain from hook. 1 DC into each of the next 3 CH, *DC3TOG, 1 DC into each of next 3 CH, 3 DC into next CH, 1 DC into each of next 3 CHs; repeat from * to last CH, 2 DC into last CH, turn. Row 2: CH 3, 1 DC into same ST, 1 DC into each of next 3 DC, *DC3TOG, 1 DC into each of next 3 DC, 3 DC into next DC, 1 DC into each of next 3 DC; repeat from * to last ST, 2 DC into 3rd of beginning skipped CH-3 turn. Row 3: CH 3, 1 DC into same ST, 1 DC into each of next 3 DC, *DC3TOG, 1 DC into each of next 3 DC, 3 DC into next DC, 1 DC into each of next 3 DC; repeat from *to last ST, 2 DC into 3rd of CH-3, turn. 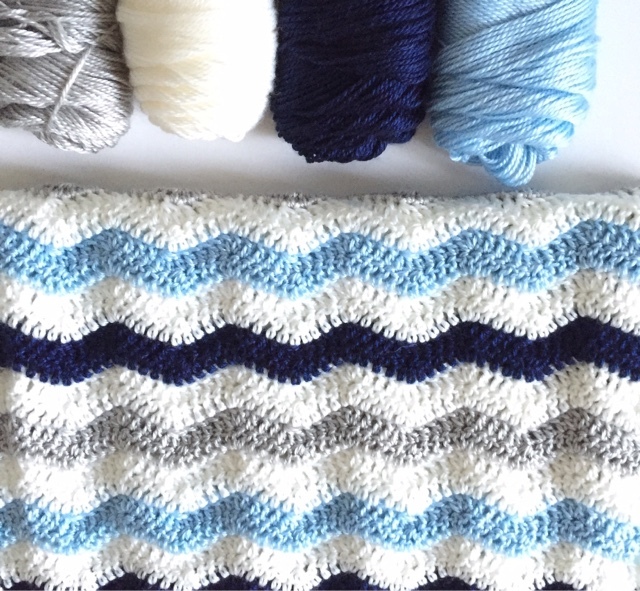 Border: Start with the white yarn and single crochet around the whole blanket in each dc on the ends, and two single crochet’s per double crochet on the sides. Change colors each round. So after doing this for awhile, you’ll realize everything is a series of threes except the ends, which are 5 DC on each side. I like putting white in between each color change but obviously you are free to choose what ever color you’d like. I’d love to try a girl version in light blue, navy blue, coral, peach and white. If I find the colors I want in the soft secret brand, I just might try it! Good luck! As always, leave me a comment if you have a question, or this pattern doesn’t make sense to you and I will help you as much as possible. The easiest and fastest way is to find me on Instagram @daisyfarmcrafts. Or shoot me an email at [email protected] or feel free to leave a comment. I also have a Facebook page, a Pinterest page, a Twitter account, and a YouTube channel all named Daisy Farm Crafts. So come and find me! I do love Instagram the best and I’d love if you’d tag me and share a picture of what you are making!